Banned by airlines and abhorred by many, durian is still regarded as king of fruits by much of the population of tropical countries. Durian has sharp thorny greenish gold shell. Inside is the golden yellow meat that is soft but firm when touched (like Brie at room temperature). When it has started to ripen, the notorious smell of sweetness and sulfur fills the air. Those who dislike durian can smell it from miles. Pick the one that is just ripened, but not over ripened. The over ripened one has an exceedingly strong smell and runny flesh. Ask the seller to open a small wedge window, so that you can see and feel the flesh. Durian is available at most Oriental grocers frozen in a clear plastic container or frozen whole with shell. Thaw in refrigerator before serving. There are several variety of durian. My favorite is gaan yow, or 'long stem' when translated literally. Gaan yow has long stem and is round like a football (or soccer ball for Americans). It tastes creamy and sweet but not too sweet or too sulfury like other varieties can be. Gaan yow is more difficult to find and more expensive. 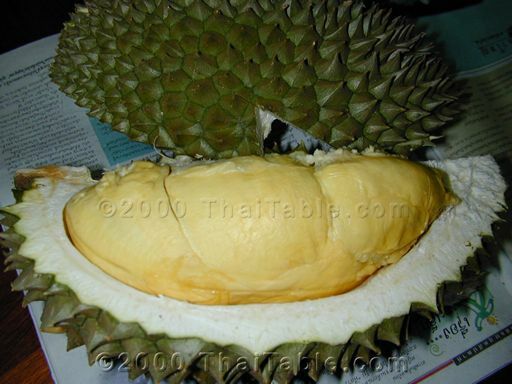 If you are in Thailand and would like to try durian, I'd recommend this variety. The widely available variety is mon tong or 'golden pillow' translated literally (I don't think I'd use it as a pillow). This variety has a larger fruit and is sweeter than other variety. It is popular among fruit sellers because of it long shelf life and its price. Mon tong is eaten fresh but is also used as dessert, sticky rice with durian (nam gati turian). Shanee or baboon, translated literally, is another variety. The fruit is oblong. Shanee starts early in the season and is gone before other varieties get to the market. After the growing season, you see this brown hard paste in plastic wrap shaped like salami at markets called 'turian guan'. The over ripened durian meat is cooked in a large pot to evaporate much of the water until it is the consistency of play dough. Cooking takes out almost all the sulfur smell and what remains is a sweet, nutty flavored dough. 'Turian guan' can be refrigerated and kept for a few months and is eaten as a snack. Recently, there is another invention, durian chips.